Soybeans and soy products such as tofu and tempeh are widely recognized for their health-promoting properties. The principle active components are isoflavones, phytochemicals which have demonstrated antioxidant, antiangiogenetic, and estrogenic activity. The isoflavones genistein and daidzein are potent antioxidants which promote and sustain the health of the body's immune system. In particular, soy isoflavones help insure the integrity of DNA against exogenous and endogenous stresses. As phytoestrogens, isoflavones exhibit weaker estrogenic activity than human estrogen but compete for the same receptor sites on human cells. This can be beneficial when a woman is exposed to external estrogen sources like xenosteriods that have been studied and shown to be harmful. Phytoestrogens like soy have shown to compete for receptor sites that these harmful xenosteriods bond to,therefore lessening the negative effects they could have on a woman's body. Isoflavones help to balance the activity of estrogen in the body. If the level of endogenous estrogen is low, isoflavones exert mild estrogenic activity. If the levels of endogenous estrogen is high, isoflavones help to moderate the effects of human estrogen. These phytoestrogens have beneficial effects on hormone-related bone decalcification. In addition to their estrogenic activity, soy isoflavones promote healthy cholesterol levels without lowering levels of beneficial HDL cholesterol. The mighty little soybean is a veritable nutritional powerhouse that has given us many interesting and versatile foods. Soy products used to be appreciated by "those in the know", health-food aficionados, vegetarians, and culinary daredevils. Thankfully, soy products are now widely consumed and are available in many forms. High in potent nutrients such as phytoestrogens(the isoflavones genistein and daidzein), and amino acids that create a high quality form of plant-based protein. Soy may be instrumental in reducing symptoms of menopause as well as the risk of developing certain cancers, atherosclerosis, and osteoporosis. 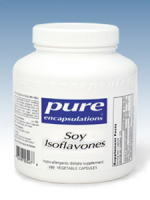 Soy isoflavones are phytochemicals(naturally occurring plant chemicals) in soy products. Some isoflavones, such as genistein and daidzein, exert mild estrogenic effects and are thus called phytoestrogens. Structurally similar to estrogen, soy isoflavones have the capacity to bind to empty estrogen receptors and relieve hormonally based symptoms of menopause such as hot flashes. It is this ability to decrease hormone reception that also seems to be the mechanism by which phytoestrogens such as soy isoflavones prevent hormone-dependent cancers. These very weak plant estrogens in soy latch onto the estrogen receptors in the breast and other tissues and they stop the more powerful carcinogenic estrogens/found in the environment from getting through. So they have a protective effect, as well as helping to balance hormones which are responsible for menopausal symptoms such as hot flushes and sweats. Phytoestrogens like soy have also been studied extensively for their effect on lowering cholesterol, so they can have protective effects in terms of heart disease, which is important in menopause. 2 to 3 capsules daily. You may reduce to 1-2 capsules daily once your symptoms have improved. Consult your health care professional before use.